Life is wonderfully dynamic; fossils are maddeningly static. They are not even snapshots, but faded, degraded, biased, partial snapshots requiring careful reconstruction. Just getting to a critter’s morphology and anatomy—its size and dimensions—requires drawing a long empirical bow. And that is but a half-step towards understanding life’s dynamism. How did this thing move? How did it develop? How did it evolve? What did it eat? How did it mate? The list of what we might want to know about an extinct lineage, plus how tantalizingly subtle are the hints we get from fossils, added to how paleontologists respond with such creative, speculative and ultimately powerful strategies, equals a philosophical challenge. Specifically, explaining how we get from the static to the dynamic. Today, I want to reflect on the role biological convergences play in reconstruction, focusing on two of the three great lineages of vertebrate fliers: birds and pterosaurs. Often, the inferences we make about extinct critters are underwritten by what we know of their living relatives. If you go to a paleontology conference on extinct mammals and birds, you’ll learn a lot about extant mammals and birds. This is because ancestry retains information, and because closely related lineages are likely to meet the same evolutionary and developmental constraints. I can learn a lot about a 20 million year old bird by hanging out with a currently living bird. Things get really tough, then, when there aren’t any close living relatives. Like for pterosaurs, for instance. Pterosaurs are archosaurs: a grand old clade which came to prominence in the Triassic after the Permian extinction. Included within the Archosaurs are the Dinosaurs (and thus birds of course) and the crocodilians. Pterosaurs were the first vertebrates we know of to develop powered flight (beating birds by a good 50 million years or so). They were extraordinarily diverse: in their 145 million year history they adopted wingspans from 250 millimetres to 11 meters, some sported long tails, some grew fur, many developed elaborate head-crests, some lost their teeth, and (we must assume) they radiated into an array of differing environments. Pterosaurs, with their light, hollow bones, are not so good for fossilization, but we have a fair number of fossils, including the earliest from 1784 pictured above. However, the K-Pg extinction was unkind—leaving no survivors—so unlike mammals, crocodiles and birds, we have no descendants with which to ground our speculation about their lifeways, development and evolution. Archosaurs today survive in two groups: the birds and crocodilians, and although the pterosaurs are more closely related to birds than alligators, as the cladogram below demonstrates, they’re hardly close evolutionary neighbours. All this makes understanding pterosaurs tricky, and makes a recent find extremely exciting. Back in 2014, Xiaolin Wang and his team announced the discovery of a new pterosaur: Hamipterus tianshanensis. Adult wing-span varies from 1.5 to 3 meters (leading Wang et al to speculate that the lineage exhibited sexual dimorphism), each sported a lovely crest, and the sheer number of individuals found—forty—enabled them to construct a fairly detailed growth-series for the lineage. That was a very impressive find. But perhaps more impressively, earlier this month, Wang and co-authors reported the discovery of a 3.28 m2 sandstone block in the Gobi desert, containing the three dimensional remains of at least 215 pterosaur eggs (here’s National Geographic’s take, including pretty reconstructions). These all belong to the lineage Wang et al discovered earlier, Hamipterus. One thing that makes the find so exciting is the existence of preserved embryos – at least 16 – which potentially can be combined with the post-hatch growth series to provide a highly detailed picture of how these critters developed. That’s an unprecedented look into the dynamism of ontogeny from a series of static shots of individuals from the same lineage in different stages of growth. Another thing which makes the find exciting is the rather embarrassing extent to which it increases our global pterosaur egg haul. Prior to December this year it was, um, under 10. Now we have over two hundred specimens! 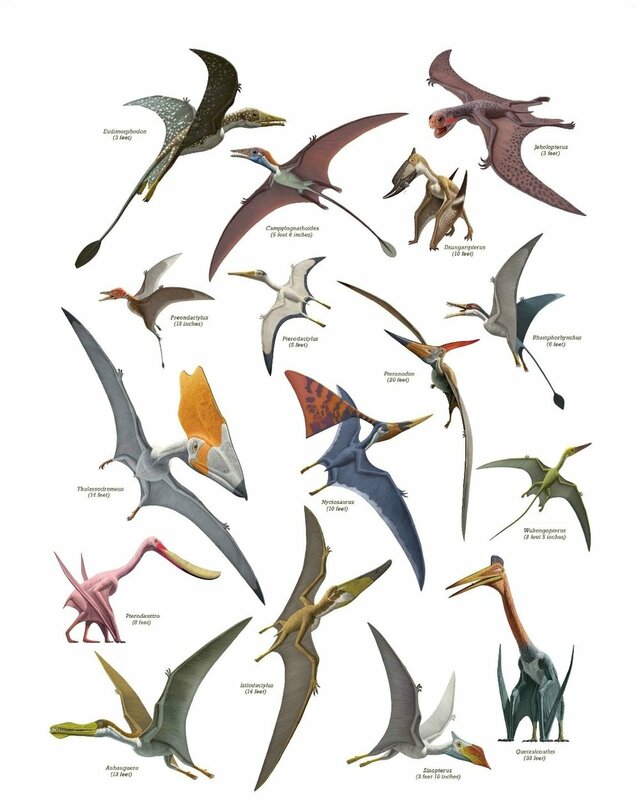 Only time will tell the ways in which our knowledge of pterosaurs will be enhanced by this rather ridiculous motherlode, but today I want to focus on the claims Wang et al make about pterosaur nesting. Our little pterosaurs, then, are not born ready to burst into flight, but rather were likely able to make some rather helpless ambulation using their hindlimbs (although see Deeming for some caution). … sedimentological data, associated with the exceptional quantity of eggs and bones, indicate that events of high energy such as storms have passed over a nesting site, causing the eggs to be moved inside the lake where they floated for a short period of time, becoming concentrated and eventually buried along with disarticulated skeletons. (Wang et al 2017, 1201). That is, for this number of eggs to be preserved together it is likely that a single—potentially large—nesting site was hit by a brutal storm, swept into a lake, and then buried. Together, this suggests that pterosaurs required care when they were born, and that such care was carried out in a communal context: potentially large numbers of adults gathered together in raising clutches. A wide range of birds, from flamingos to penguins to albatross, engage in large-scale clutch raising in often extraordinarily noisy creches. Such behaviour has a bunch of potential advantages: large numbers likely decrease the chances of any particular individual getting eaten, and the presence of multiple adults provides protection. Moreover, if good conditions for incubation are rare, then communal breeding may be necessary. Does this strategy represent a ‘convergence’ between birds and pterosaurs—that is, did these two lineages, separated by millions of years of evolution, nonetheless evolve the same solution to the problem of caring for their helpless, flightless kids? [analysis of the embryos] strongly suggest that the P. guinazui reproduction mode was most comparable to Mirandornithes, thus further indicating that this pterosaur species was in all aspects an ecomorph of modern flamingos. (Grellet-Tinner et al 2014, 764). The term ‘ecomorph’ is highly suggestive: it was coined by Ernest Edward Williams back in 1974, as a “species with the same structural habitat/niche, similar in morphology and behavior, but not necessarily close phyletically.” That is, ecomorphs are the product of evolutionary convergence—different lineages from divergent evolutionary histories nonetheless converge in terms of behaviour, morphology and ecology due to similarities in environmental challenges. That’s pretty cool (although I’m a bit cautious about going so far as saying these critters are true ecomorphs!). Today I want to reflect on what this convergence actually gets us, scientifically speaking. So, what should we make of the roles convergences might play beyond the evidential? I’ll consider two: one I like, the other I, well, don’t like. It is a truism in comparative biology that similarities due to analogy (shared adaptive function) are ‘shallow’. The deeper you dig the more things diverge. 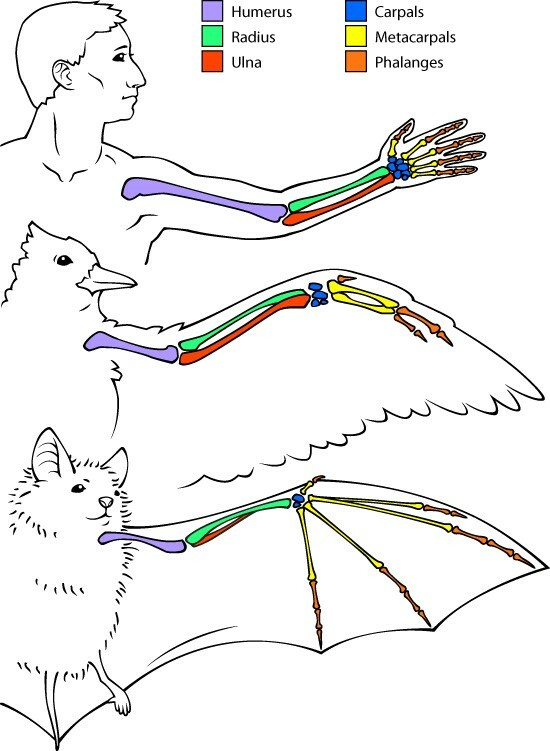 Bat wings and bird wings have similar aerodynamic properties but their structure diverges radically, despite their deep homology as tetrapod limbs (Griffiths 2007, pp 216). This precludes any form of contact incubation by the parents (as seen in modern birds). However, adults may have attended or defended nests… (Deeming 2017, 1125). Flamingos have (pretty) strict pair-bonding, engage in odd communal courtship displays, build nests, and are, well, pink due to their brine-shrimp and algae diet. Even if there are similarities between them, I seriously doubt that pterosaurs are reptilian flamingos. Indeed, given the millions-of-years history and extraordinary diversity of pterosaurs, I would expect their breeding strategies to be highly diverse. Not all birds are like flamingos, and likely not all pterosaurs are like Hamipterus. This holds for the evidential use of convergences too: if we expect high diversity amongst the lineages we’re interested in, this restricts the generality of the claims we might make on even well-founded reconstructions of particular lineages. So, if I think the evidential justification is weak in this case, and I think taking flamingos as model pterosaurs is problematic, is there some justification to be had for the appeals to convergence in this case? I think there is. Rune Nyrup has been developing a view about the nature of ethnographic analogy in archaeology (typically using information about current foraging societies to inform reconstructions of prehistoric societies, although Nyrup reads ‘analogy’ in broader terms) where, instead of emphasizing their evidential powers, he reckons they are valuable for other reasons. In addition to evidential uses, he emphasizes how such analogies can generate hypotheses and provide reasons to pursue hypotheses—they provide a kind of ‘initial plausibility’. Inspired by those ideas (and building a little on my own) I want to suggest a third use for convergences in historical reconstruction. A better way of thinking about convergences in this case is to see them as a basis for what Kim Sterelny and I have called productive speculation. Speculation (as I’ve argued over and over again) is a crucial part of historical reconstruction: it is often the only way we have of figuring out what evidence we might have about the past. A speculative hypothesis captures what we’ve observed, but goes far beyond those observations. Not all speculation is created equal: some is ‘idle’ insofar as the ways in which it goes beyond the observed doesn’t suggest new observations we might make—they don’t increase our empirical grip on the world. ‘Productive’ speculation does do this: even if the hypothesis itself proves to be false, examining it reveals new empirical pathways into the past. (the philosophers in the audience might notice a parallel here to Popper’s notion of hypotheses being ‘more or less’ falsifiable…, or perhaps Lakatos’ related ideas). Modern sea turtles nest colonially, but while preparing their own nests, females may inadvertently damage previously dug nests and expose eggs to predators. Perhaps the dimpled pterosaur eggs reported in [Wang et al] indicate that Hamipterus also experienced nest damage through intraspecific competition. (Deeming 2017, 1125). Notice that the appeal to colonial nesting in sea turtles generates a hypothesis which connects certain features of the Hamipterus remains to their lifeways. But it doesn’t merely generate hypotheses: it also opens up new kinds of questions: can we, perhaps by examining communal-nesting critters with pterosaur-like eggs, identify different kinds of damage which might be indicative of such competition? Can we distinguish that kind of inadvertent damage from that caused by predation? If so, then we’re in a better position to empirically understand just how pterosaur breeding is similar to, and differs from, things like flamingos on the one hand, and things like sea turtles on the other. In such cases, negative results are just as interesting as positive results: in the latter case, we learn about how life tends to repeat itself, in the former case, we learn about how life generates uniqueness—this is a point Nyrup emphasizes in archaeology (in fact, this perhaps strengthens my claim that uses of analogy in archaeology and paleontology are instances of the same kind of reasoning…). Indeed, such productive speculation plays a crucial part in what I have called ‘exquisite corpse modelling’—inferring between several imperfect analogues to reconstruct a unique lineage. What makes putative convergences a particularly good source of productive speculation? That is, why is having an actual, concrete analogy or convergence useful, as opposed to just making something up? They provide empirical bridges between lineages, allowing our knowledge of one to provide insight—and inspire new tests—regarding the other. Because we’re interested in both how such lineages converge and diverge the results of such tests and insights are often both fascinating and themselves provide stepping-stones into new avenues of inquiry into these distinct lineages. Even if pterosaurs are not reptilian flamingos, then, the thought that they might be is revelatory of the kinds of productive speculation paleontologists use to uncover the past. It is one of the messy, creative strategies that allow us to uncover, understand and explain apparently unique past events on the basis of incomplete traces. Even with such a remarkable find as that reported by Wang and colleagues, sometimes it is the appeals to convergences that allow us to go beyond static fossils, into the dynamism of past life. Thanks to Rune Nyrup for useful comments!